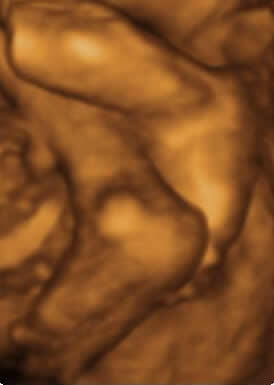 As I have said we do self-elected, non-diagnostic, ultrasound bonding scans in 4D. Ok so what does that actually mean? The fact that its self elected means that it is something that you choose to have done and it is purely for your own bonding purposes. Although Dr Mahmood has many years experience in diagnostic ultrasound we are doing non-diagnostic scans, so you must attend your hospital scans and see your ante-natal provider. This scan is not a replacement for any medical or diagnostic scan. The most commonly asked question is what is 4D. We all know what 3D is, having put on silly glasses to watch films or concerts, myself included, but 4D is less commonly known. It was my sister (thank you Katie) who enlightened me by telling me I had not paid attention when Dr Who was on, I'm sure I wasn't the only one hiding behind the sofa, but anyway, as Dr Who knows "Time is the fourth dimension". Therefore 4D means we are watching a 3D image which is happening in Real Time. So as you are watching the baby and it kicks, you will feel the kick and see the baby kick on the screen at the same time. Ultrasound was developed 30 years ago from the principles of Radar, by a clever doctor who realised that it would be better to "look inside" a patient to see if there was a problem there before cutting them open. It wasn't widely used on pregnant women in the beginning but has now become the normality for all pregnant women. It is quite special for expectant Grans and Grandads to see these scans as most of them missed out when they were expecting. The wonderful thing about this technology is that we can see family characteristics and traits. Often the baby has habits/characteristics like the mother or father; for example, if the hands are behind the head often either mum or dad sleeps with their hands behind their head. 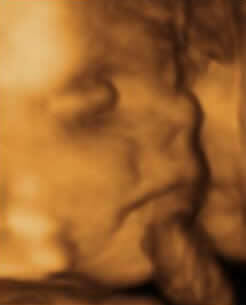 The baby might be very lively during the scan and often will be a lively child and vice versa. I didn't know my daughter could smile, yawn, blink and play with her toes while I was carrying her, I imagine she did a lot of opening of her mouth, as she likes to talk!! Some little girls are modest and cover their bottom with their hands, it is almost as if they are aware we are watching them. We have bribed shy babies with the promise of strawberries or chocolate and have had older siblings or expectant dads sing to them to get them to move to a better position, for most it works. Some, who happen to have parents with stubborn traits, ignore us! One thing is for certain it is an incredible insight into a fascinating world in which they live. Yes, we do all love our job and no, babies do not all look the same. Some have been the image of their mums or dads; but the one certainty is that all have been completely amazing.